Our Disclosure of Your Information: • FSJ Jeep Parts does not sell or commercially make available specific information about its Users or Users other than in aggregate form, except in cooperation with law enforcement bodies in regards to content violations or violations of applicable laws. 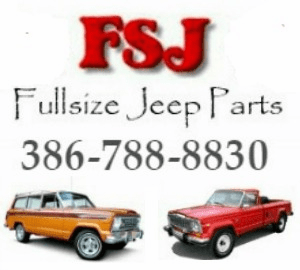 • FSJ Jeep Parts uses Secure Socket Layer (SSL) to encrypt payment information and User data against unauthorized access. However, we cannot be responsible for how third parties, whose links appear on our site, use your information. • FSJ Jeep Parts has implemented additional precautions to ensure the privacy of your personal information. Access in the company is limited to only individuals who need to be able to see customer data in order to perform their job functions, such as the billing department. Important personal data is backed up on the network to help insure its integrity. replacement parts for Jeep® vehicles. Copyright © 2019 FSJ Jeep Parts a S.A.T. Products Company All Rights Reserved.